If you’ve ever known a collector of anything one thing you learn is the collector seldom has a concept of the word “enough.” No matter how many trading cards or figurines or fossils or whatever it is the collector fancies they already own, if they find one that they don’t already have in good condition at a reasonable price, they’re all over it. And my penchant for collecting dictionaries is no exception. While other people were watching the Super Bowl last Sunday, my husband and I were hitting a few thrift stores. And guess what I found? Now the sad part is that we were doing this specifically because we’re both working on hall costumes for NorWesCon (at the end of March). My husband actually found things for one of his costumes, but what did I find? 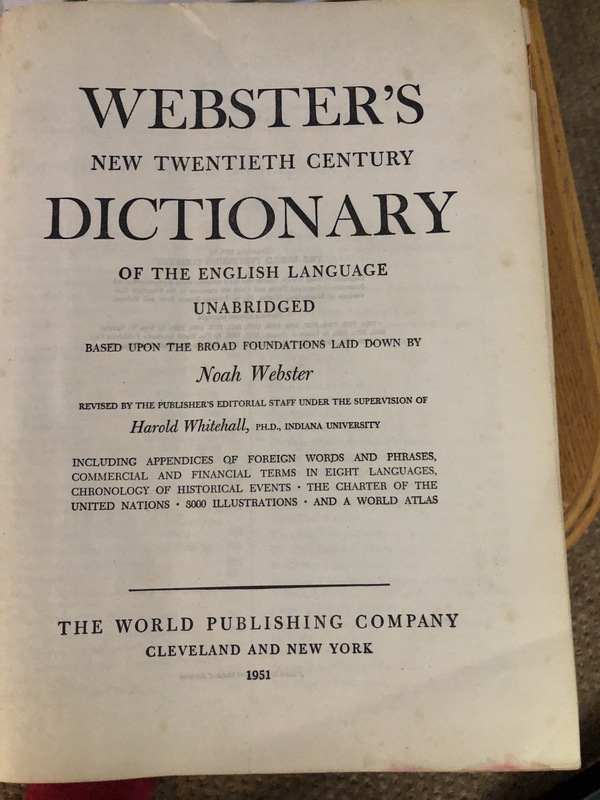 Well, I found a copy of the 1951 edition of the World Publishing Company’s New Twentieth Century Webster’s Dictionary of the English Language Unabridged. Yes, that whole thing was the official title. This was one of the dictionaries produced after the legal ruling that found the Merriam-Webster Company could not prevent other companies from using Noah Webster’s name on their dictionaries even though they weren’t actually using Webster’s original dictionaries nor operating under the auspices of the agreement made between Mr. Webster’s estate and George and Charles Merriam back in 1843. The World Publishing Company only produced this edition, a two-volume version, and a slightly revised 1953 edition before selling out to Macmillan Publishing USA. This dictionary, while being labeled “unabridged” and spanning approximately 2300 pages isn’t exactly one of the most highly regarded, given that a third of that page count is actually a desk encyclopedia, and the editorial staff hadn’t been working on it for as long as some of the more storied dictionaries. Which isn’t to say that it’s a poorly made dictionary. But its primary claim to fame is that the editorial staff for this edition was headed up by Professor Harold Whitehall, of the University of Indiana. Whitehall was an interesting choice to edit an American dictionary because Whitehall was British. Whitehall was born in 1905 in Ramsbottom, Lancashire, England. He got his first degree at Nottingham University, studied for a while after at London University, before coming to the U.S. where he obtained is Ph.D. from the University of Iowa. He taught at the University of Iowa, at the University of Wisconsin, and Queen’s College New York, before settling at the University of Indiana where he spent the rest of his academic career. While he was at Michigan, he served as assistant editor of a Dictionary of Middle English (the English spoken during the 12th, 13th, and 14th Centuries), which was probably why he was recruited by the World Publishing Company. And why it’s important that Whitehall worked on this dictionary is, that while the number of words and depth of the definitions weren’t on a par with other unabridged dictionaries of the time, the New Twentieth Century Webster’s Dictionary had the most thorough etymologies of any America-published dictionaries published up to that date. Because linguistics—specifically the history and derivation of our language—was Whitehall’s passion. When Macmillan acquired most of the World Publishing Company, they already had a staff of dictionary editors, but they asked Whitehall to stay on, created the post of Linguistics Editor for him, and they released several more editions of this dictionary for subsequent years, before the company was acquired by another publisher in 1998, who sold off the reference division to yet another company in 1999 and so on. Whitehall stopped working for them some time before 1960, though he continued to teach English and Linguistics at the University of Indiana until his death in 1986. In honor of my finally acquiring my own copy of this dictionary famous for bringing a new level of etymological rigor to American dictionaries, this is a perfect time to talk about why understanding when your dictionary was created and how it is being maintained is important. Don’t assume that just because there are lots of free dictionaries available on the internet that anyone started with a high quality source or experts are keeping it up to date. And this is important because the language is a living thing that changes over time. Notice from the image above, there is no other definition given. 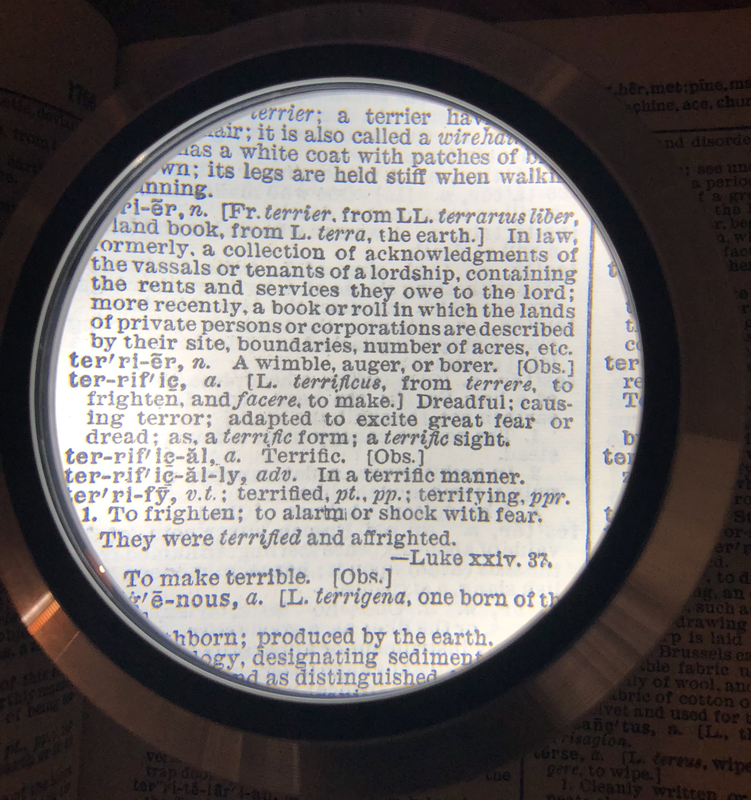 If we jump ahead to one of my 1987 dictionaries, for instance, we find the primary definition being “causing great fear or terror”, the second as “remarkable or severe” and only the third definition, marked informal is “very good or wonderful.” Whereas my 2001 Oxford New American Dictionary lists the “causing terror” definition as archaic, but even then, the primary definition is “of great size, amount or intensity,” and the second sense of “extremely good or excellent” is still listed as informal. Although that may be because the editorial board of the Oxfords include a lot of British people. Most of my American published dictionaries from the late 90s on list something along the lines of “extraordinarily good” as the primary definition. But this is part of the reason I am obsessed with dictionaries and how they are made. I have watched the meanings of some words change in my lifetime. It’s important to know this happens, particularly if you ever read books or stories written many years ago. Some words don’t mean what they used to. That’s not a bad thing, but it can cause some confusion and consternation from time to time. Did I mention, that while consternation now means “feelings of anxiety or dismay” that is once used to mean “terrified”?